Talking about Ottawa condo prices with one of my clients recently, I realised it’s been 6 years since I looked at the average selling price trend for older vs. newer condo apartments in Ottawa. Here’s the article from 2012: Are New or Re-Sale Condos a Better Investment? Fast forward to today; let’s take a look at the average selling price trend for condominium apartments, comparing units built before 2008 to units built in 2008 or later (i.e. within roughly the past ten years). We’ll look at the entire Metro Ottawa area, and then isolate the urban core to compare trends. 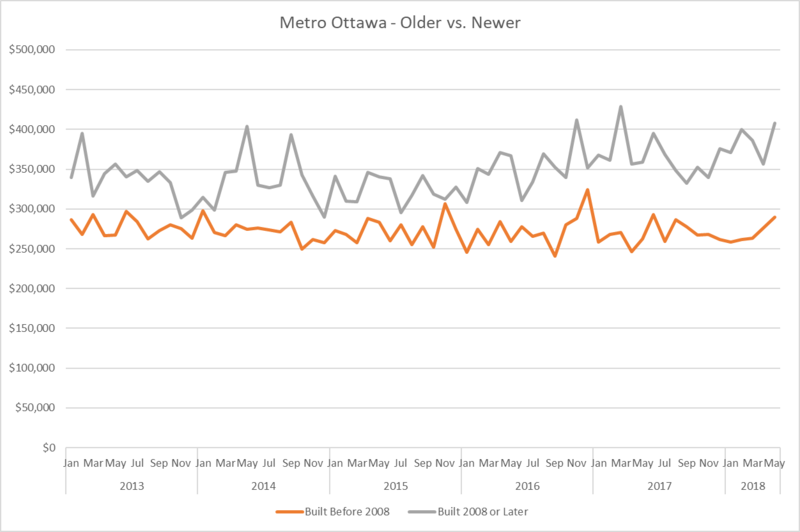 First up, across Metro Ottawa, the graph below shows that condos built within the past ten years sell for more than older units on average. This will not surprise anyone, but what about the trend? Do newer condos appreciate more or less in value over time compared to older units? To my eye, the two trend lines on this graph run almost parallel to each other. There may be slight evidence of a widening gap in the most recent couple of years, but not enough to make a reliable assessment. The initial conclusion is that re-sale condominium apartments appreciate in value at roughly the same rate regardless of their age. The first graph includes sales of all condominium apartments: re-sale and new construction. The graph below includes a separate curve showing only new construction condos sold through the MLS system. This represents only a portion of all new construction sales as many are sold without MLS and Realtor services. The small number of sales included in this curve mean there is more variability in average price. The question is, how much impact do new construction sales have on the overall MLS average price statistics? The third graph removes new construction sales from the equation, showing only re-sale condos. 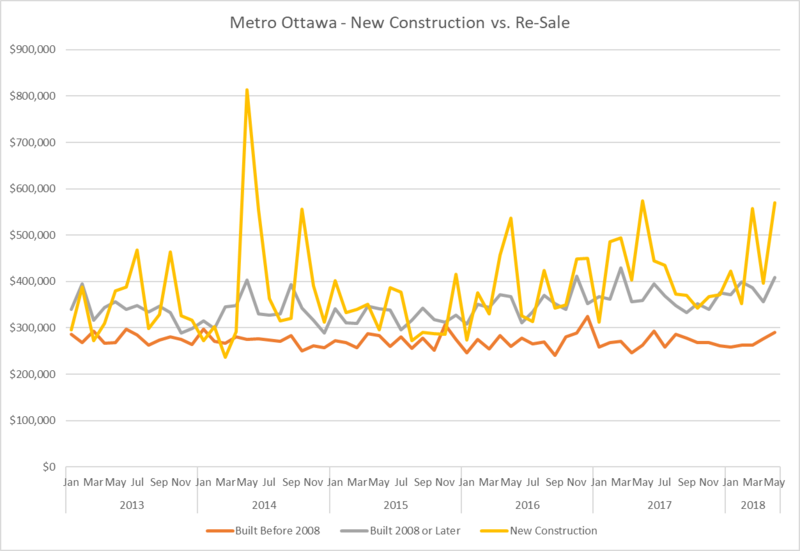 The graph below is the result of subtracting the yellow line in graph 2 from the lines in graph 1 that included all condominium apartments, re-sale and new construction. There are a couple of places on the graph where the two curves run closer together with new construction units removed. The gap in the most recent two years seems slightly narrower than it did with new construction units included. 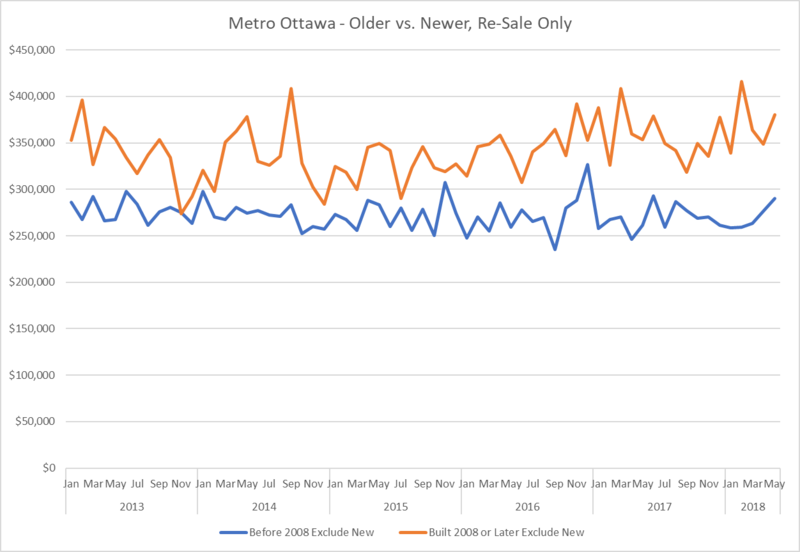 We are making approximations here, but this analysis appears to strengthen the argument that once new condominiums have been absorbed into the re-sale market, their average price appreciation does not change substantially with age. For investors, the main conclusion from the above data is that you need to assess condominium apartments on factors other than estimated appreciation. This supports the general approach I recommend to investor clients: invest, do not speculate. In selecting a property for investment purposes, the fundamentals of quality real estate are key: location, size, layout, view, construction quality, finishes, amenities. Acquiring desirable, higher quality properties will increase the potential for greater appreciation relative to the average. However, an objective analysis of the numbers is the ultimate test. I developed a property analyser spreadsheet to help my clients with that objective analysis. If you’d like to try it out, send me an email or fill out a contact form on this site and state your case. I’ll send you a copy and you’ll receive periodic updates to this tool by remaining on the list of registered users. 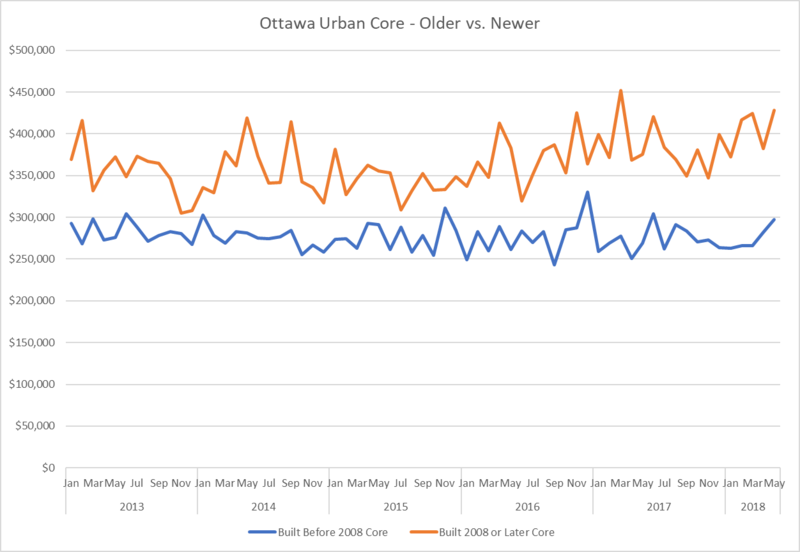 Before signing off, I also ran the re-sale average price analysis for older and newer condominium apartments in the urban core of Ottawa only, to see if there is a significant difference in price appreciation inside the greenbelt compared to the suburbs. Have a look at this graph and let me know what you think. I’d love to hear your observations and feedback in the comments below.